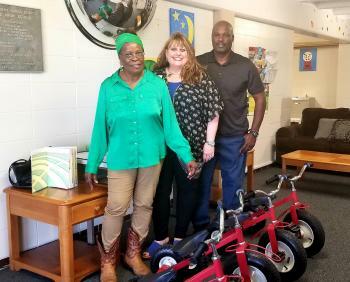 Students at Hempstead Early Childhood will enjoy gym time a little bit more after Marvin Hood and Patricia Hood delivered seven brand new all-terrain tricycles to Hempstead ECC on Wednesday, March 27. Earlier in the month, Mr. Hood had expressed an interest to HECC Principal Stacey Baughn-Hunt in helping the students at the early childhood center. Ms. Baughn-Hunt stated there was a need for items to help students with gross motor development skills which are directly linked to reading comprehension skills. Members of the Hood family were more than happy to help the students by donating the seven tricycles to the campus. “Our students are thoroughly enjoying the tricycles during gym time,” said Principal Baughn-Hunt. Hempstead ISD would like to thank the Hood family for helping our tiny Bobcats. Hempstead ISD...One Town. One Team. One Goal. Overcast throughout the day and breezy until evening.